The Galaxy Note 10.1 still looks a lot like the Galaxy Tab 2 10.1 but there are minor changes all over the design. As a result, the new version doesn't look as good as the original although, considering the ultra- minimalist design, the difference is very subtle. We do think though that the grip has been somewhat improved. The metal frame houses the two speakers on the sides (in landscape position) and has gotten wider at the top and bottom. In addition, the speakers themselves are now on the inside end of the frame, not in the center. The hardware design changes continue at the back as well, where the frame extends to fit the camera department in. The nest of the camera lens is now a bit rectangular, rather than a circle. 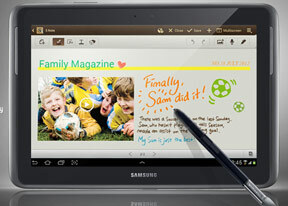 Built around a 10.1-inch PLS LCD screen with a resolution of 1280 x 800, the Galaxy Note 10.1 wouldn't wow anyone. Android slates such as the ASUS Transformer Prime Infinity and Huawei MediaPad 10 FHD are rocking full HD resolution, and the iPad 3 is in a league of its own. Despite the average resolution, the image quality is decent. Viewing angles are very good and blacks look reasonably deep (naturally, we'll take the usual measurements once we get our hands on a retail unit). Pixel density is nothing to be excited about (149ppi), but big tablets like the Note 10.1 are viewed at a bigger distance than phones, so it's not much of an issue. Still, if you've seen the new iPad, the difference in sharpness is quite noticeable. The two front-facing speakers are either side of the screen. We found this location to much better suit gaming and movie watching than the sides or the back of the slate. And since the speakers are positioned in the upper half of the tablet,covering them with your palms when holding the slate is not likely to be an issue. The microphone is at the bottom, which is something to consider if you're going to make calls in loudspeaker mode (the mic at the bottom might get muffled if the tablet is docked). Unlike the previous version of the tablet, the new design features a slot for the S Pen. It's located at the bottom right, just like on the 5.3-inch Galaxy Note. At the back of the Galaxy Note 10.1 we find an updated 5MP camera with an LED flash next to it. The camera is quite capable of shooting the occasional photos and HD videos as long as you are willing to put up with the ridiculousness of taking photos with a 10-inch slate. Just like before, the Samsung Galaxy Note 10.1 is powered by a 7000 mAh Li-Ion battery. There are no official battery life quotes yet, but we'll be doing our own tests when we obtain a retail-ready unit. The plastic put in use is from the glossy variety rather than the matte one used in the MWC-born Galaxy Note 10.1. It feels very nice to the touch, but can be quite slippery and attracts a lot of fingerprints. The good thing is they are not as easy to spot on our white test unit. You cannot pop the back cover open to access the battery, but that's to be expected from a tablet. Build quality is quite good. Our test unit did produce the occasional creak while being handled more roughly, but the retail version might even have these sorted out. The biggest difference is it's now square in shape, with softly rounded corners, for a much more comfortable hold. It's shorter too and has gotten rid of the attaching clip found on the previous Note tablet's stylus. Not badly missed that one - the stylus compartment more than makes up. There's a button on the side of the S Pen, which can be used to perform certain actions.